When I was first asked to participate in a Circle Journal, I was intrigued but I had no idea what this sort of journal was. 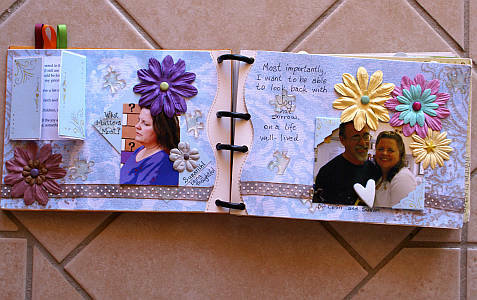 scrapbooks bind together memories to warm our hearts". I think the best way to get a sense of meaning for this type of scrap booking is to think of it as a game of Round Robin - where everyone in the circle gets a turn to scrap a page or two in your album. The idea of circle journals started a long time ago and they have probably existed in some form for centuries. 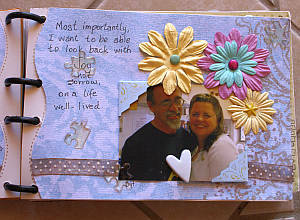 Think of shared diaries, written journals and art journals. Today, people who make papercraft projects still enjoy being inspired by others, holding someone else's work in their hands, and making friends in this unique way. 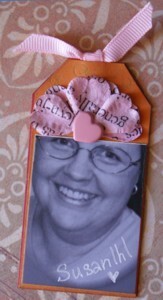 I participated in a swap with twelve other papercrafters and I couldn't wait to see my own album again! I farewelled it sometime at the beginning of the year and it came back to me at the beginning of the following year, give or take a month or two.Each person had a month to make their entry so that wasn't a bad time frame. I was sure looking forward to receiving it, and I wasn't disappointed when it finally arrived either. So how does this type of swap work? 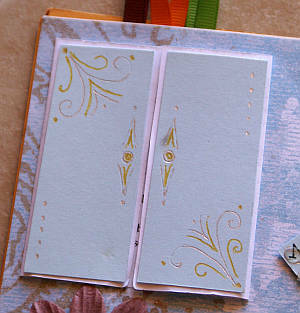 First, find a group of friends who would like to participate in a circle journal swap. Or find just one friend who wants to trade albums back and forth with you. I found my group in an online forum. Decide also how long each journal will stay with each group member. A few weeks may be long enough, but I recommend not allowing longer than a month between swaps, as the whole project could lose momentum and people could lose interest. You need to keep just a tiny sense that there is a deadline involved so people will strive to have their pages completed in a certain time. Agree on a starting date and check that everyone is ready. 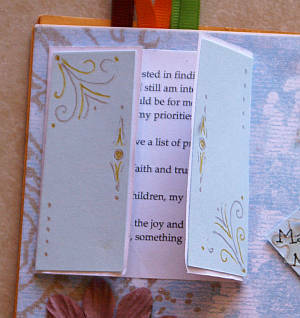 Decide on an order within the group so all of the journals pass through each person's hands. We just listed people in order of 'sign-up' and each person mailed their album to the person below them in the list. For example, I constantly received albums from my friend Ali, and constantly sent my completed ones on to my friend Shelly in my swap. Check to see that everyone is ready to start, then have everyone mail their albums off to the next person on the list on the same day. People report that the end of a Circle Journal swap is the best part of all. Each person in the group winds up with a beautiful keepsake from their friends, illustrated in each person's own unique style. Other lovely outcomes are that you will all know each other just a little bit better, and you will have ideas and examples of papercrafting techniques you might not have seen before. That all spells inspiration to me. Who is our favourite singer/artist/family member/animal/plant/mineral!! If you could travel by train anywhere in the world, where would you go and why? What have you learned/What has life taught you? Who was your best teacher in life? Whatever theme you choose, I hope you enjoy your experience with Circle Journals.